Wyoming + solstice = lots of daylight. Lots of daylight = lots of climbing but not so much sleep. Lots of climbing + not so much sleep = lots of tired and many dumb mistakes. Yesterday, we tried to make up for lost sleep by napping next to the crag. Mico and I both swear the other fell asleep while we remained alert. Either way, I don’t think much sleeping was accomplished. Still tired, we struggled through a last climb and vowed to take the next day off. As we were packing up for the day, a dude who we’d spoken with earlier approached us and told us his party was abandoning him. He asked if he could join us. After a group powwow (excluding our new potential friend), Mico and I said yes. The dude climbs pretty hard. We saw him redpoint 5.13a. I can’t remember his name; that’s why I keep referring to him as the dude. We estimate his age to be somewhere between 18 and 24. He has plans to be in the Lander area until August, so he might be in school. We made tentative plans to climb with him tomorrow. We’re hoping he’s not a serial killer, but they’re not always easy to spot, the better ones at least. Despite my intention of building up the sleep bank, I woke up at 6am (not as early as we had been waking up, but not late enough to get in my full eight hours). I listened with envy to Mico’s heavy, even breathing and tried to pretend I was asleep as I grew increasingly hungry. Since we weren’t in a rush, we decided to make our signature julienned potato and fried eggs breakfast. Usually Mico does the dangerous job of julienning (a julienne is a kitchen utensil with many little teeth and a single long blade. Sliding a potato back and forth across the surface of the julienne yields hash brown-sized shards of potato). Julienning a potato is pretty easy, but julienning a sweet potato is much harder because it has a tougher consistency. It involves a lot more force. Nearing the end of the sweet potato, I was getting ready to celebrate. 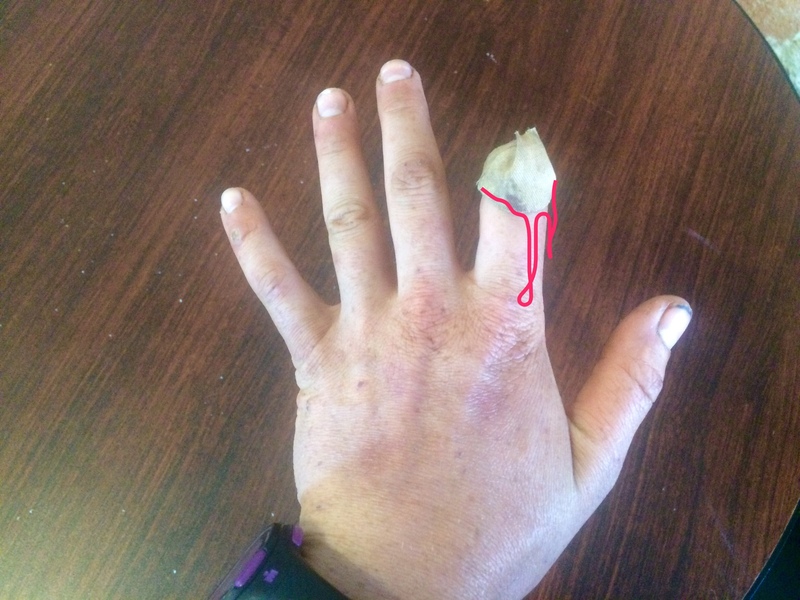 I did a final push across the julienne and felt a sharp pain in my index finger. I pulled it back and discovered that a chunk had been julienned, including the nail (see picture below). Luckily, there’s no problem superglue can’t solve, so after sealing up the gushing wound and picking julienned bits of finger out of the hash browns, we had breakfast. The day went slightly up from there. We bought a bag of mushrooms at the local farmer’s market and learned that in Wyoming anyone is allowed to sell their wares at a farmer’s market. We then went to Ace Hardware where we bought a drillbit to fix the rear view mirror (it had gotten loose and would tilt toward the ground within three seconds of straightening it. We’d basically been functioning without a rear view mirror since day 1). We also got a spare key made for the car. Back at the car, I promptly dropped the drillbit and was unable to relocate it. Mico wanted to put the spare key on his keychain, but couldn’t find his keychain. While searching for his keychain, he lost the spare key. There was a moment where we were both digging through junk in the car, laughing maniacally because we couldn’t seem to do anything right. Eventually, I found the drillbit and Mico relocated both the keychain and the key (the key had been in his pocket the whole time). With everything under control for the moment, we renewed our vows to get more sleep.